Raining during your stay? There is still so much to do! Depending on how hard it is raining, if you have good rain gear and how keen you are to go outside, you can do most activities at the resort. The weather also has a tendency to change about ten times a day: a bit of sun, a bit of rain, a bit of wind… A taste of everything summer in Quebec has to offer! To best game plan is to be ready for any of these alternatives and have a back-up activity ready to go. Even if it’s grey or raining, a visit to the top of the mountain is always worth the trip. The ride up and back in the gondola offers a panoramic view of the Laurentians from its highest peak… Or at least a moody Instagram picture! Get your creative juices flowing by using your rainy day to create a cuddly friend at Univers Toutou, paint a masterpiece at Studio Creatif or personalize your own t-shirt. With a fully-equipped gym and a great indoor family-friendly pool, head to the Aquaclub La Source for a fun time or a good workout. New since this winter, Mission Liberté offers an enthralling form of year-round indoor entertainment right in the pedestrian village. Themed rooms will immerse you in a fun and family-friendly experience where you must solve riddles an locate clues in order to find the key to your freedom! 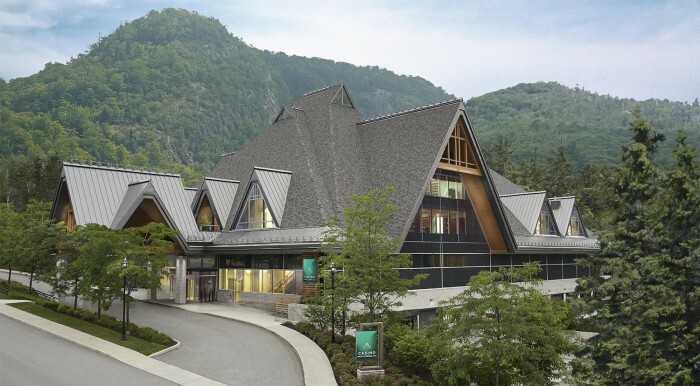 Surrounded by the natural beauty of the mountain’s Versant Soleil, the Casino de Mont-Tremblant offers so much more than the thrill of gambling. The gorgeous chalet-style casino houses 500 slot machines and a variety of card and gaming tables but also boasts an award winning, in-house restaurant. So, even for those who don’t like to gamble, it’s worth a visit to enjoy a great meal, a beautiful view and live musical performances. Discover hidden gems in Tremblant with our diverse variety of places to shop. With over 30 retail locations to be found in the area, from small boutiques to larger chain stores, you’re sure to find that unique souvenir or that perfect present you’ve been looking for. A rainy day is a perfect excuse to indulge in a luxurious massage, enjoy the well-being of thermotherapy or soak in a hot-tub. You can find great spa services at Spa Le Scandinave and in the resort at the Westin Resort and Spa or Fairmont Amerispas. We’ve been making quite a name for ourselves as a delectable food scene. Local French Canadian flavors mix with international culinary influences to create a diverse array of dishes to be enjoyed in over 30 restaurants. More in the mood for a drink? There are plenty of watering holes to grab a pint or glass of whiskey. So it’s wet outside. Why not go all in? Unless there’s a major electrical storm (which don’t happen too often), you can still go kayaking, rafting, ziplining and so much more! It’s just water right? All in all, a rainy day in Tremblant is still better than a sunny day at the office!